While traveling across country is definitely quicker by plane, you miss out on so much! I grew up taking road trips with my family cross country because it was simply too expensive to fly 5 of us back and forth from my dad’s duty station back home to Texas. Looking back I wouldn’t have liked to do anything differently. That isn’t because I don’t love to fly either. I simply love road trips. What I love most about road trips are the memories that become part of you. The activities you and your family do together to pass the hours. The sights you see along the way. The prayers you pray as you thank God for keeping you safe. The field trips you take part in along the way. The beauty of God’s creation that you see with each passing mile. The whispered prayers you speak as you pass accidents on the highway. Road trips aren’t just about getting from point a to point b. They can be so much more! Geography is one of the best subjects to teach while on a road trip! Sure you can pack up any (or all) of your school books and bring them along. However, geography is the one of the few subjects that kids can actually experience while on a road trip. This is one of the first steps of each of our road trips. We live over 2,000 miles from my hometown, so we have to make quite a few stops along the way. I have my children help me plan our road trip by calculating how far we can/should travel each day. They have to determine how many approximate hours and miles each day will consist of and how many days it will take to get from point a to point b. You can also add mathematics as you go on your road trip by having your kids figure out how many miles/hours it is to get across each state via the route you’re traveling. You could have them add these numbers to the next idea too! Using black line maps (of the entire country or state where you’re traveling) and an atlas have your kids locate where you are. Next, have them write in the name of the state or country you’re in and it’s capital. You can also have them add major rivers or cities you stop in for more details. For memories if you make a field trip stop, they can add that in as well! It never ceases to amaze me how different the topography is from one state to the next. When you’re traveling in a different country it is even more amazing! Topography is an important part of geography class. Our kids need to know and recognize how different the land they’re traveling through is! Whether you have them write about it in a journal, take pictures to use in a scrapbook or simply talk about the topography as you’re driving, don’t let them miss out! Unit studies are a great way to cover a variety of subjects while learning about geography! You can create your own geography unit study, which I have done many times. However, there are some great options out there for ready to go unit studies, especially if you’re visiting another country! Our favorite publishers are Unit Study.com and Techie Homeschool Mom! The beauty of travel is remembering where you’ve been, the sights you saw and all everything you don’t want to miss. The saying is that memories never fade, but the truth is that they do sometimes. Photography has a way of bringing it all back to you, even if you’ve forgotten it. If you have time, stop at each state sign, country border or significant place along the way and document your road trip with photography! You can never too many pictures of you and yours kids! Each place you travel has a history that is all its own. Before you head out give your children the opportunity to research and visit the library to learn about the history behind the geography of your upcoming road trip. Another option is to purchase books that you can bring along and take turns reading them aloud as you travel! There is a work of art waiting wherever you go — someone just has to create it! I am no artist, but I can appreciate it and photography is my art! My daughter however, loves to whip up a sketch or paint a landscape of places she’s been. If you have artists, be sure to give them the opportunity to create artwork as part of your road trip. The geography from each one will be unique to the location you’ve stopped in! You never know what is going to happen on a road trip, so it important to document happenings along the way. 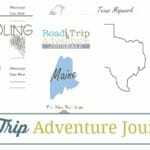 Writing in a road trip journal, creating detailed papers for each step of your travel, writing poetry or just taking simple notes with notebooking pages each day are great ways to remember the difference in geography throughout your road trip! Make sure you take time to get outside on your road trip! Don’t just “fly” from one place to the next. Enjoying your travels requires slowing down enough to take it all in. Stop to take a nature walk and see what types of floral and fauna are growing where you are. Find a place to picnic to allow you stop and smell the roses. Plan a trip to a local zoo or animal sanctuary to see what animals are native to the area. Practice all of your memory skills by learning the country and/or state capitals, birds, flowers, etc. as part of your road trip. This is a great way to pass the time on the road when kids (or parents) get “bored”! These are just a few ideas to help you make road trips part of your homeschool geography class! Don’t let them limit you — use them as a springboard for more ideas. 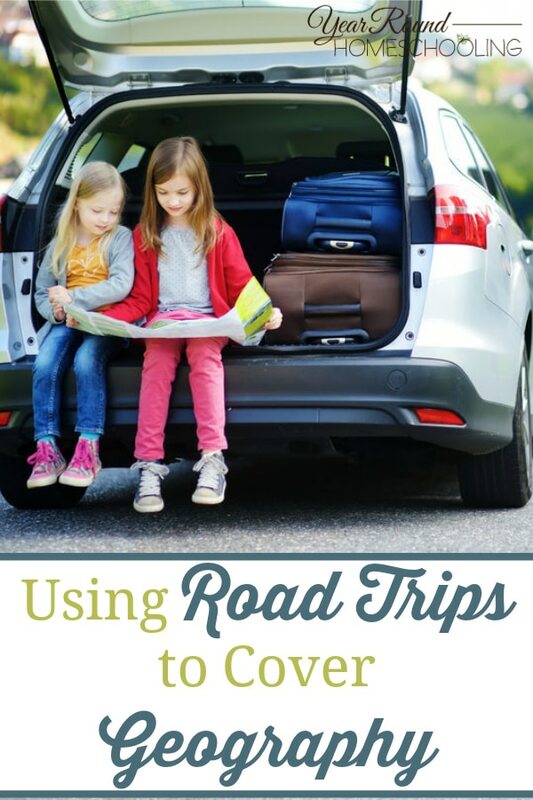 Get your kids involved by asking them what they’d like to cover on the road trip because almost anything can be part of your homeschool geography class! What is your favorite way to cover geography as part of your road trips?